Increase your visibility with reflective decals by Seward Street Studios! This Reflective Dog Prints decal kit comes on a sheet that is 3-1/2" wide and 5" high. The kit comes with 15 Paw Prints, each Print is 1" high. 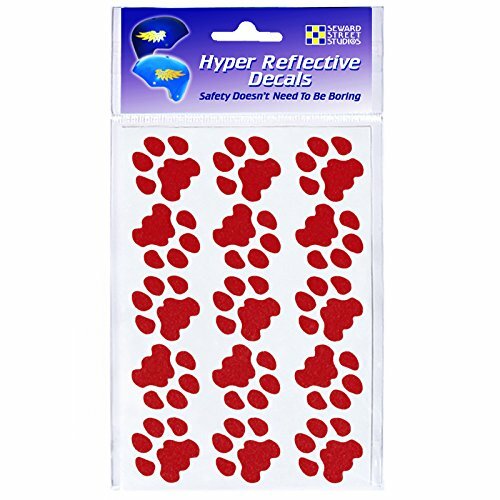 The Reflective Dog Tracks Sticker Set is cut from Automotive Grade Retro-Reflective Vinyl. The same reflective decal material used on emergency vehicles, such as police cars and fire trucks. Available in 12 colors! Reflective vinyl works by bouncing light back to the original source. When lit up with a flashlight or headlights, the light bounces off microscopic glass beads that are embedded inside the vinyl. The decals will look like they are lit up from within! Reflective decals can be applied to any smooth, hard surface, like plastic, metal or glass. You can add safety to your bicycle helmet, hard hat, scooter, stroller, and motorcycle. To see the reflective glow, hold a bright flashlight next to your head, at eye level, and shine it on the decals. The brighter the light, the brighter the glow! You can also see the glow if you take a flash photo of the decals. Share your glowing photos with all of your friends! Order reflective decals for the whole family! Kids love to customize their bikes and helmets with stickers, and parents love how reflective decals can make their kids more visible to drivers. Seward Street Studios Reflective Decals-Safety Doesn't Need to be Boring! Decal Kit comes with 15 Cat Print Decals. Each decal is 1" wide. Increase your visibility at night by adding fun reflective decals to your outdoor gear! Easily applies to any smooth, hard surface such as bike frames and motorcycle helmets. Available in 12 colors of automotive grade retro-reflective vinyl. They look like regular decals in daylight, but glow at night when lit up by headlights and flashlights. The brighter the light source, the brighter the reflection! Made from the same reflective decal material used on emergency vehicles. Weatherproof and waterproof adhesive is resistant to Salt, Snow, Rain, Grease, and Oil. Lasts up to 7 years of outdoor use. If you have any questions about this product by Seward Street Studios, contact us by completing and submitting the form below. If you are looking for a specif part number, please include it with your message.